Taking opportunities to appreciate and affirm a partner’s worth by showing attention enhances the positive experiences within marriages and partnerships. 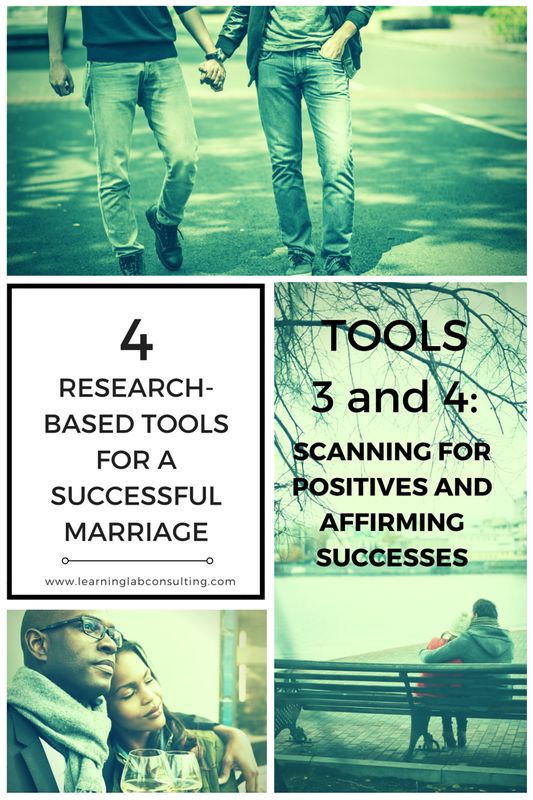 In a healthy marriage, partners “scan” the environment for these opportunities. The Atlantic article “Masters of Love” by Esfahan Smith, she points out that anything that a partner shares is a “bid” to connect. If I said, “This article is so interesting!” On some level, I am asking my partner to be interested with me, to pay attention, to connect. He can choose, however, whether to do this or not. Each choice adds to a bank of “my partner values me” or “my partner is not interested in me” that can help or harm a marriage. According to psychologist and marriage expert Gottman (who can identify if couples will stay together with a 94% accuracy rate), “There’s a habit of mind that [successful couples have] which is this: they are scanning social environment for things they can appreciate and say thank you for. They are building this culture of respect and appreciation very purposefully. [Unsuccessful marriages] are scanning the social environment for partners’ mistakes.” His wife, Julie Gottman adds that they are “scanning their partner” specifically for clues of mistakes as well. Kindness includes everyday interactions, but it also includes the way a couple appreciates successes together. Celebrating the successes of a partner is perhaps even more important than fighting well. According to researcher Shelly Gable, how couples reacted when one of them had good news is a predictor of whether the couple will stay together. So, according to Gable, there are four ways one could respond to, let’s say, a promotion. In an ideal scenario, a partner’s successes will be acknowledged with an active constructive response that both affirms the value of the person and the importance of the event. So what are the take-aways from this research? If some of these behaviors are new, it might feel awkward at first to try them; however, like a muscle, as the strategies are implemented over and over, they will become more natural. Because of this, the key is to keep going even if it is uncomfortable or strange. Personally, I would say that feeling seen and giving and getting kindness in my own marriage might be the two most significant factors to increasing our happiness over time. It has changed my perspective to see marriage as a place to cultivate and grow my own kindness and appreciation toward another person whom I love, to try and see the best in that person every day. This sounds self-explanatory for a marriage, but from my own personal experience, I have found it easy to slip into not noticing all of the small things Jamey does to keep our lives going. Conversely, it is easy to miss all of the good things that others see about loved ones when I am stuck in the grind of getting things done and paying more attention to life’s ups and downs than I am to the relationship. This being said, I think (know) it is possible to change based upon science and personal experience. The human brain, and therefore human behavior, is capable of vast growth. Knowing this, and then applying it to the reality of marriage, is life-giving for individuals and relationships.